While a happy medieval marriage was possible, just like today, marriages could also break down. Joan, the ‘fair maid of Kent’, was the daughter of Edmund of Woodstock (d.1330, one of the younger sons of Edward I), and she spent much of her childhood in the household of Queen Philippa of Hainault. Over the winter of 1340-1341, when she was around twelve or thirteen years old, she was married to Sir William Montagu, the son of the earl of Salisbury, who was one of Edward III’s best friends. The grand alliance of Montagu with this ‘spare’ Plantagenet daughter shows the power of marriage as a form of courtly reward for loyal royal service. 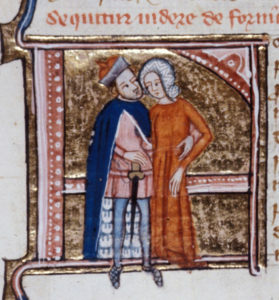 Yet in 1347, Montagu’s steward Sir Thomas Holland opened proceedings at the papal court in Avignon, claiming that he had already married Joan in secret, (making ‘a clandestine marriage’) in spring 1340. Now that he was a wealthy man thanks to the profits of fighting at the battle of Crécy, Thomas Holland could afford to marry for love, and the historian Michael Bennett suggests that the story of the clandestine marriage might have been a convenient legal fiction*. 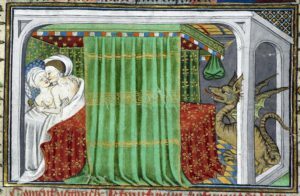 It’s possible that by 1347 the Montagu marriage may have broken down, with Joan embarking on an affair with Holland, her husband’s steward. However, the idea of a premarriage saved the honour of all parties. 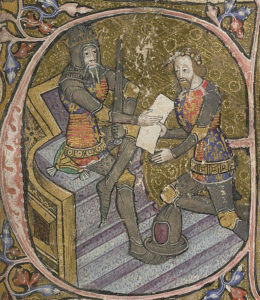 Once widowed, Joan would go on to marry her cousin the Black Prince, the eldest son of Edward III, in 1361. This marriage must again have been a love match, for negotiations had been underway to marry Prince Edward to a more suitable bride, Margaret of Flanders- the kind of strategic royal union that cemented diplomatic and trading alliances. In later life, Joan was referred to sarcastically as ‘the Virgin of Kent’, and seems to have ended up with something of a reputation for loose living. 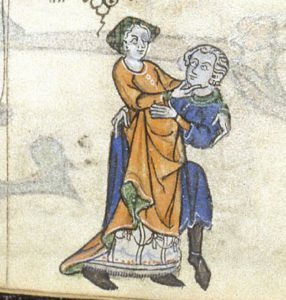 In the Peasants’ Revolt of 1381, the peasants who invaded the Tower of London made (sadly unrecorded) ‘ribald remarks’ to the dowager princess, and even, most disrespectfully, invited her to kiss them. Less happy than Joan’s love matches is the story of the prolonged marital breakdown between John de Warenne, the seventh earl of Surrey, and his wife Joan of Bar. Joan was the daughter of the Count of Bar in northeast France, and a granddaughter of Edward I – a great political match for John. When they wed in 1306, John was around twenty. Joan was probably below the age of ten. While this was not an unusual age gap for the period, the marriage proved unhappy and childless. By June 1313, Joan was living in the Tower of London, supported by her uncle, Edward II. Warenne was living with his mistress, Maud Nereford- a deed for which he was excommunicated by the bishop of Chichester. Lengthy legal battles followed, for Warenne wanted to dissolve his marriage to Joan, marry Maud and legitimise his two Nereford sons. By 1316, Joan had departed for her native France. All Warenne’s legal efforts to dissolve his marriage were unsuccessful, and his two sons by Maud Nereford eventually joined the Hospitaller order. The couple may have reconciled in the 1320s, but in 1337, Joan returned to France with her household. By the 1340s, Warenne had another mistress, Isabella Holland, the daughter of a leading knightly follower of the earl of Lancaster. His will refers to her as ‘my companion’. When John died in 1347, he had at least six illegitimate children. All were left gifts and bequests in his will, but Joan received nothing. Perhaps unsurprisingly after such a difficult experience, Joan didn’t marry again, living as a widow until her own death in 1361.